My painter primed and painted a heavily nicotine wall. The stains are bleeding through. What do I do now? Hello Jrenee, and welcome to the Community! If the painter cleaned the wall first with TSP, but it sill bleeds through then I suggest you try applying B-I-N Shellac-Based Primer to the surface, maybe 2 coats possibly, then once dried then paint it again, this should hide any stains that were there before. Painters have for years used non-water soluble primers, such as BIN pigmented shellac or Original Kilz oil based. Nicotine is a water soluble substance which will come right through a water based primer. Products such as Kilz Premium claim to stop nicotine stains, but there is a caveate: you must wait 24 hours before finish coating. and even then, a second coat of Premium might be necessary. Why wait and why be uncertain if the stain has been killed? Just use BIN or Original Kilz and be confident that the stain has been killed and that you can begin your finish coat only an hour later! Unfortunately the walls were not cleaned first. Can they be cleaned now even though there is two coats of primer and two coats of paint? No, cleaning at this point would be futile. Your best choice is to prime gain using either BIN pigmented shellac or an oil based primer, such as Original Kilz or CoverStain. Nicotine is water soluble and apparently is continuing to bleed through the several coats of water based primer and paint. 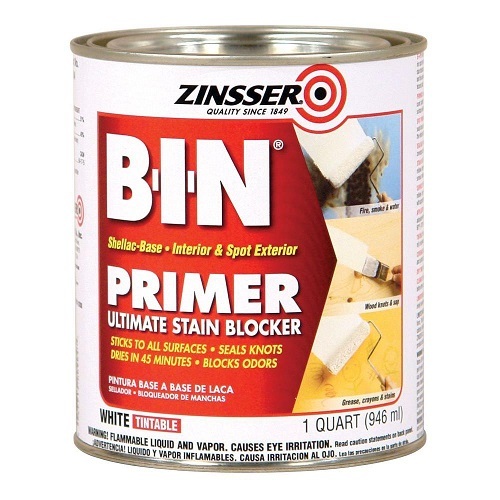 A non-water based primer will stop the stain bleed through AND nicotine odor bleeding through. Your "painter" should have known to wash the walls first and then use the proper non-water based primer. Hopefully he has not been charging you extra for his incompetence! Lol Cleaning is not futile! I'm living in an apartment that had heavy nicotine stains when I moved in. An industrial de-greaser called Zep dissolves it like water- it's ridiculous how much comes off even on the walls that don't look bad AND supposedly have been painted with Kilz! The nicotine runs down the walls- even when you couldn't see too much on wall (had to look close)! I've used it on nearly every surface: paint, wood, metal, old 50's tub (not plastic), caulk, grout, tile. Spray paint and wood: wipe off after a few just a minute- after you see it's come loose/dripping down the wall. then wipe with different clean damp rag. Wood gets a little dry so be sure to wipe down any overspray when working other areas. Follow up with some Old English. I tried Melaluca's wood conditioning and it put little cracks all over the cabinet door. Some wood treatments 'protect' and 'condition' by protecting from water and end up over-drying wood that was already dry- even though they claim to have oils. Old English is amazing and cheap. The rest of the surfaces that I listed you can wipe grime/nicotine off and if they are supposed to be white, I don't rinse or wipe with a damp rag. Zep will whiten "discolor" them. Wear rubber gloves with all this nicotine and chemical. Zep doesn't irritate my skin, they are actually for the nicotine! Zep is an industrial strength chemical and is strong smelling when you first spray so you want to do it in a well-ventilated area. In a small area like a closet or hallway you should wear a mask. In less than 5 minutes there is no strong chemical smell, so no worries, just very strong initially. And for spraying overhead, I use protective glasses. Good Luck! And I agree with Ordjen- Don't let that professional painter charge you extra. If he's done a dozen jobs, he knew what he was getting in to and would have advised/asked before proceeding. My point is that after having "primed" with a water based primer, it is a waste of time to try to wash the walls. You are still going to have to re-prime with an oil or shellac based primer, so forget further washing and just seal that stuff in! My preference is for BIN, which will totally seal in the yellow staining AND the smell. There are actually water based primers which claim to seal in water soluble stains and odors. These are epoxy based, rather than the more common acrylic based sealers. Kilz Max is one of these wb nicotine sealers. Zinsser also has such a product. Unfortunately, they do require a longer, overnight cure time before finish coating. Here, the quick dry oil and shellac primers have the edge if time is of importance. These dry and can be re-coated after only an hour.